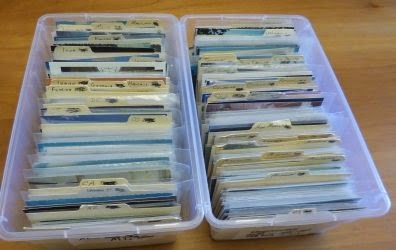 I'm assisting Dan Lester in disposing of his 10,000 plus library postcard collection. The largest portion of the collection (over 6,000 postcards) went to the American Library Association Archives last year. 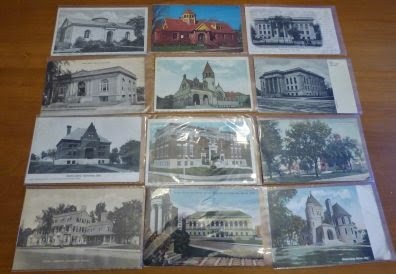 I have a group of 1,100 postcards that are duplicates of those in the ALA Archives collection. 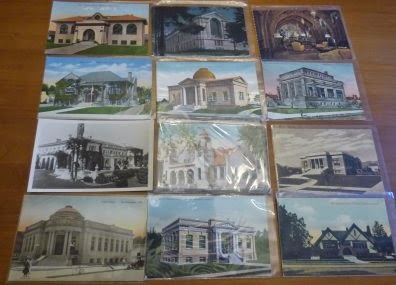 These postcards include libraries from 44 states and the District of Columbia. There are no duplicates, but there are multiple views of some of the larger libraries. The largest state group is for California with 145 postcards. Followed by New York with 68 cards, Massachusetts with 64 cards, Illinois with 61 cards, Indiana with 53 card, and the rest with less. I am willing to let the entire collection go for $800 postpaid which is a wholesale price. I would rather sell it to a library history enthusiast than a postcard dealer. 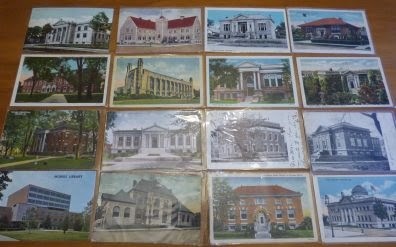 If purchased individually from postcard dealers or on eBay, the collection would probably cost between $2,200 and $3,000 or more. Some images of the collection are shown below. If interested contact me (Larry Nix) at nix@libraryhistorybuff.org. Abbotsford is a historic country house in Scotland in the town of Galashiels, near Melrose. It is the former home of Sir Walter Scott, and one of its most prominent features is the library that Scott assembled. There are many postcard views of the library. The one above is from my collection, and it is special in that it was sent by a librarian to a librarian with a message that references Scott's library. 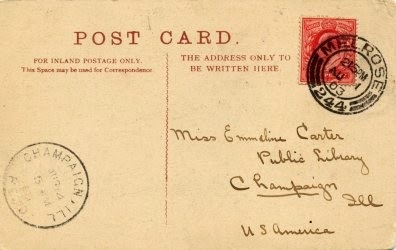 The postcard was sent from Melrose, Scotland on August 4, 1903 by Renée B. Stern (1875-1940) to Emaline Carter at the Champaign (IL) Public Library. 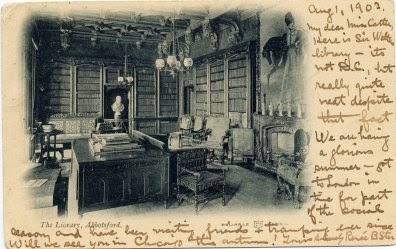 Stern writes: "My dear Miss Carter, Here is Sir Walter's library - its not D.C. [reference to the Library of Congress ? ], but its really quite neat despite that fact." Stern served as a librarian at a number of Chicago area libraries, and was active in the Chicago Library Club. She was a writer and co-edited Book Trails, a multi-year/multi-volume publication of stories and poems for children. She also was author of Neighborhood Entertainments (1910). As I noted in a previous post about Dartmouth’s student literary societies, early academic libraries were not very friendly to students. As a result students sometimes formed their own libraries as part of student literary societies. Two such literary societies were created at Pennsylvania College (now Gettysburg College) in Gettysburg, PA. They were the Philomathean and Phrenakosmian Societies. 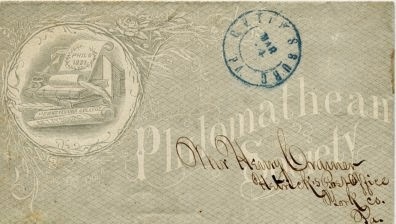 I have in my collection of postal librariana covers (envelopes) related to both of these societies (see above). 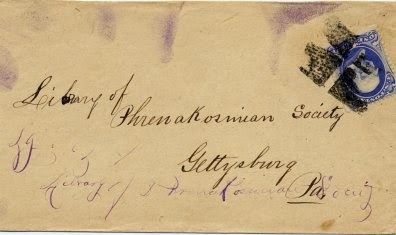 The very attractive cover from the Philomathean Society was mailed sometime in the 1850s (the postage stamp is on the back of the cover), and the Phrenakosmian Society cover was mailed in the 1880s. Both societies were formed at Pennsylvania College in 1831 and both were disbanded in 1924. At some point, as occurred with other student society libraries, their libraries were probably merged with the college library. The archives of the two societies are now part of Special Collections & College Archives of Gettysburg College. 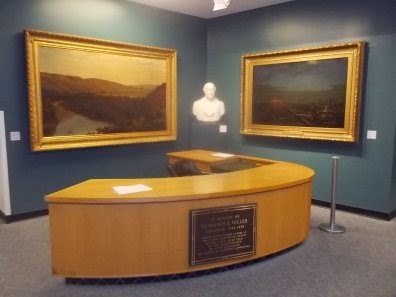 The Philomathean and Phrenakosmian Societies existed at other colleges and there is a Philomathean Society still in existence at the University of Pennsylvania. 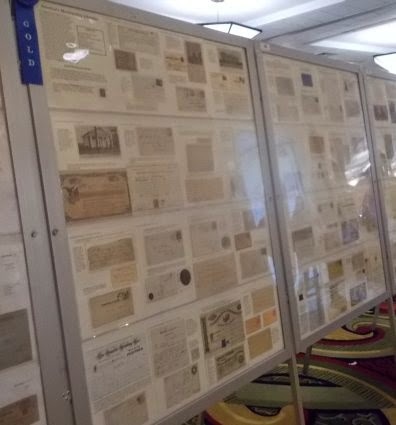 Each year I enter one or two philatelic exhibits in national level stamp shows with various library history related topics. I’ve been doing this every year since 2003, and I find the development of these exhibits to be both enjoyable and challenging. 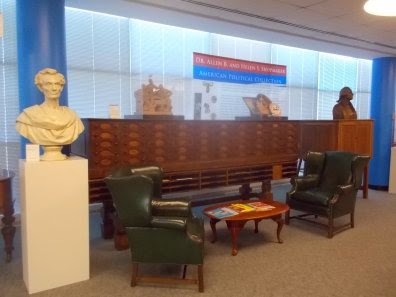 This year I developed a five frame exhibit on “America’s Membership Libraries” and a one frame exhibit on “Hiram E. Deats – The Life of a Jerseyman”. The debut of these two exhibits was at the Saint Louis Stamp Expo last month. Philatelic exhibits are judged by a panel of experts accredited by the American Philatelic Society. They are judged against a set of criteria that varies depending on the division in which the exhibit is entered. My exhibits are entered in the Display Division which allows the inclusion of ephemera as well as postal artifacts. Each exhibit is eligible to receive one of the following medal level awards (in ascending order): bronze, silver bronze, silver, vermeil, and gold. Exhibits are also eligible for a number of special awards. 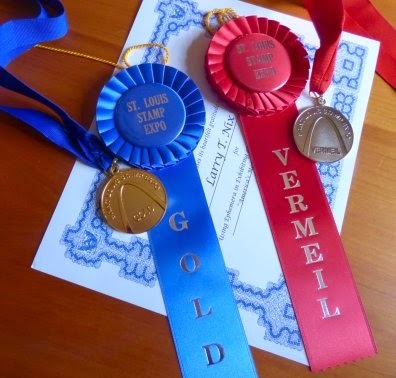 In St. Louis my “America’s Membership Libraries” exhibit received a gold award, and the “Hiram E. Deats – The Life of a Jerseyman” exhibit received a Vermeil award. For both exhibits I was also recognized by The Ephemera Society of America for the use of ephemera in my exhibits. My primary motivation in exhibiting is telling the story of America’s libraries, but it's always nice to receive recognition for my efforts. Incidentally, Hiram E. Deats was a world renowned philatelist and also a big supporter of libraries. Click Here for more information about Deats. Last week while in St. Louis for a stamp show and a family visit I had the opportunity to visit the St. Louis Mercantile Library, one of our nation’s most unusual libraries. Because of my interest in membership libraries, I was already aware of the history of the Mercantile Library (click HERE to see previous post). I just had not had the opportunity to see it firsthand. I was very impressed. Fee based membership libraries in America had their heyday in the 18th and 19th centuries, and all but a few did not survive after the first couple of decades in the 20th century. Those that did survive did so by substantially revising their missions. In regard to its current mission this statement appears on the website of the St. Louis Mercantile Library: “The task of the Mercantile Library as a research library is to make its collections, which have come to concentrate on Western Expansion and the history, development, and growth of the St. Louis region and of the American rail and river transportation experiences, available to the widest number of local and national users.” The Mercantile Library has also entered into an arrangement with another institution to ensure its survival well into the future. 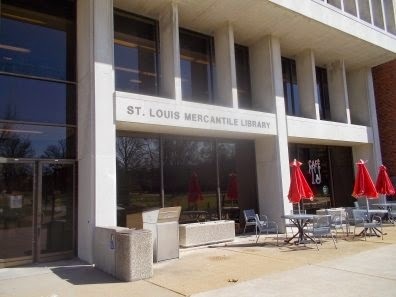 The Mercantile Library is now part of the Libraries of the University of Missouri – St. Louis and shares a building with the Thomas Jefferson Library of the University. 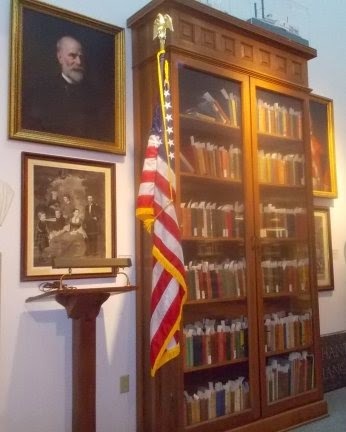 In addition to its extensive general historical collection the Mercantile Library is home to the Herman T. Pott National Inland Waterways Library, the John W. Barriger III National Railroad Library, and an extensive art collection. I had the privilege of participating in one of the excellent docent led tours of the Mercantile Library which take place on Saturday and Sunday each week. If you are ever in St. Louis I highly recommend a visit to the St. Louis Mercantile Library. A few pictures from my visit appear below. A memorial for Clarence E. Miller who worked at the library for 67 years and was Librarian from 1941-1958. One of the locked rare book cases. A vintage card catalog no longer in use which contained the "Harvard size" catalog cards.